to the webmaster of this site . 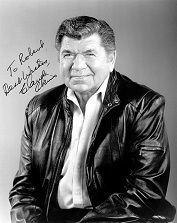 This fan website is dedicated to providing information on the life and work of Claude Akins (May 25, 1926 - January 27, 1994), one of the finest character actors in motion picture and television history. Appearing in close to 100 movies and over 150 television episodes, he became a familiar figure to 100's of millions of people. There's some disagreement among fans about which was his best role, but among those folks who knew him personally there is no disagreement on one point: he was one of the nicest, most down-to-earth folks you'd ever meet. In 1986, Claude received the Outstanding Indian/Native American of the Year Award of the American Indian Exposition. We provide links to text and photos on other websites. We ask anyone who knew Claude Akins to email their stories and/or photos to us for possible inclusion on this site. Claude Akins Interview for "Sheriff Lobo"
Site design and content copyright ©1997-2019. All Rights Reserved.